Credit: Kasai S., et al., Applied Physics Express, Feb. 16, 2018. 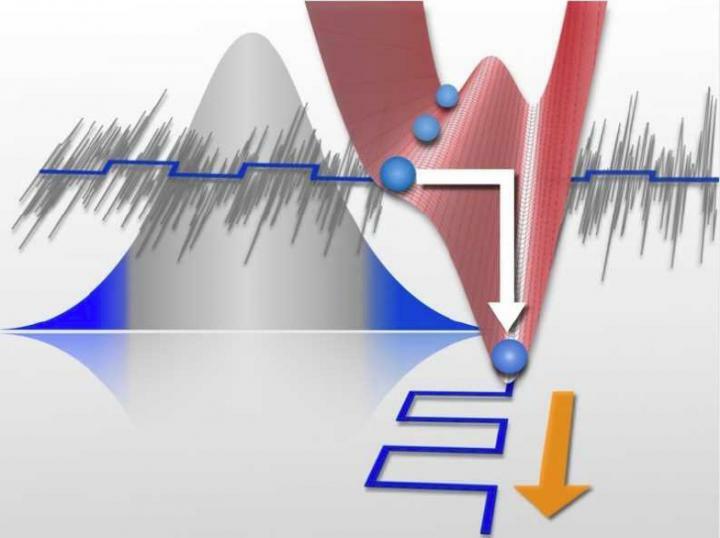 A team of Japanese researchers has discovered a new mechanism to explain stochastic resonance, in which sensitivity to weak signals is enhanced by noise. The finding is expected to help electronic devices become smaller and more energy-efficient. Noise is generally a nuisance that drowns out small signals. For example, it can prevent you from catching what your partner is saying during a conversation. However, it is known that living organisms find it easier to detect predators in noisy environments since noise enhances the sensitivity of the sensory organs. This phenomenon, called stochastic resonance, is considered to be of great use for engineering devices and addressing noise problems in various other fields. However, there have not been convincing explanations as to why noise enhances sensitivity to weak signals since initial report of the phenomenon in 1981. One stumbling block preventing researchers from fully understanding the phenomenon is the complexity in nonlinear theories involving friction and fluctuation, both considered to be essential for the phenomenon. To address this problem, the team, comprising Hokkaido University Professor Seiya Kasai, Associate Professor Akihisa Ichiki of Nagoya University, and Senior Researcher Yukihiro Tadokoro of Toyota Central R&D Labs., Inc., established a simple model that excluded friction force, a parameter that they consider negligible in nano- and molecular-scale systems. When a transition occurs without friction, the sensitivity of the bistable system to a Gaussian-noise-imposed weak signal becomes significantly high. Furthermore, the researchers found the relative difference – which determines the sensitivity – of Gaussian distribution function diverges in its tail edge. This means that the sensitivity becomes anomalously high by increasing the threshold of the bistable system. This theory has been experimentally verified by an electronic two-state device called the Schmitt trigger. The finding is expected to pave the way for using noise rather than eliminating it, which will contribute to establishing new technologies. It could help electronic devices become smaller and more energy-efficient. "Since Gaussian noise is commonly found, our study should help us better understand various nonlinear and fluctuating phenomena in the natural world and society." says Kasai.